Cats will wrestle and play with each other and sometimes even get a little rough, but that doesn't necessarily mean they are a dominant cat. Cats who live together and that normally get along will exhibit non-painful ear biting, grabbing, chasing, and other mannerisms as a part of their playful activities. These behaviors develop when a cat is a very young kitten and are understood by well-socialized cats, but cats who were not well socialized may not know how to communicate well with other cats. Dominant and pushy cats can be problematic, especially in multi-cat households. Cats who are more dominant than other cats will display some specific behaviors depending on the situation they are in. Dominance in a cat can appear at a young age but it will become especially apparent once it's socially mature or when its about two to four years of age. This is the age cats typically will test their boundaries with other cats to establish a hierarchy. Simple dominance will be exhibited by a cat by marking or spraying urine on territory, stealing and hoarding toys, rubbing its face on items it wants to claim as its own, and claiming specific areas to sleep. Cats who live alone may even exhibit these behaviors due to its natural instincts–and you may not even notice! But a dominant cat that lives with other cats will be more obvious. 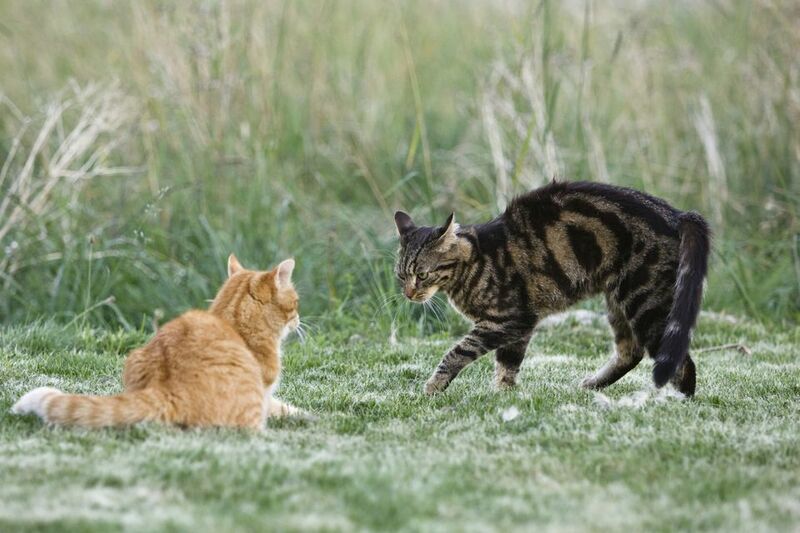 Dominant cats may attempt to establish their dominance in a multiple cat household by hissing, hitting, and growling. They may also urinate in areas that the other cats frequent, push other cats out of the food bowl until they are done eating, and make the other cats feel threatened. Dominant cats may also target sick cats in the house. Cats can sense and smell changes in other cats, often before the owner even knows about it. Therefore, they may be pushier and act out for no apparent reason towards a cat that isn't feeling well. Stress can also trigger a dominant cat to act out. Displaced aggression is often observed in multiple cat households when an indoor cat sees an outdoor cat through a window and takes out its anger on a different cat. Other major household changes may also cause this type of dominance display. Hierarchy can change with the introduction of a new cat or if you have several cats living together. Some cats will act dominantly in one room with one cat and suddenly switch roles in another room with another cat. If a cat doesn't get out of the way of the dominant cat, then they are automatically choosing to fight. Passive aggressive mannerisms from the dominant cat, such as excessive licking, standing on, or sitting on the other cat may be displayed, but swatting and even biting may occur if the submissive cat chooses to stand its ground for too long. Why Are Some Cats More Dominant Than Others? Socialization as a kitten is an important part of growing up. Kittens who don't have an opportunity to play and interact with litter mates may exhibit more dominant behaviors because they didn't learn limitations or develop self-control. Feral kittens, kittens who needed to fight for their food, and kittens that were allowed to play too aggressively may also grow up to be dominant cats. Most people aren't able to oversee every life stage of their cats so it's hard to make sure the first eight weeks of a kitten's life don't contribute to or enforce dominant behavior. But there are things a cat owner can do to decrease dominant behaviors in their kitten or adult cat. Be sure to discourage any aggressive play and don't allow your cat to bite or grab you. If you have multiple cats, be careful that you don't give one cat more attention than another, as this will lead to jealousy. Feeding multiple cats in separate locations with separate bowls is also encouraged to decrease dominant behavior displays. Positively reinforcing good behaviors is better than trying to punish a cat. If your cats are spending time together, be sure to give them treats and pet them. Play with them together while giving them treats and verbally praise them if they are getting along well. This will reinforce the type of behaviors you want to see in your cats, even if one of them is more dominant or pushy than the other. Can Cats Have Obsessive Compulsive Disorder?